From the back cover: "Lizzie Mast was the world's worst cook - there's little doubt about that in the little town of Hernia, Pennsylvania. 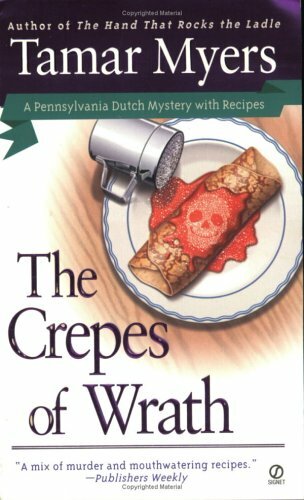 So when someone kills her with a bad batch of crepes, most folks think she got what she deserved. But not Magdalena Yoder. She's eager to bring the killer to justice. While the local police chief is busy running his political campaign, newly "deputized" Magdalena agrees to take charge of the investigation. But who could have guessed that sifting through clues would lead her straight to her own PennDutch Inn, where the list of guests is starting to read like a list of suspects?" Loved this one. Lots of funny, laughing out loud parts. Some great recipes for crepes.